One of the overlooked aspects of combat sports is the reality that to get ready for a fight, someone has to fight. 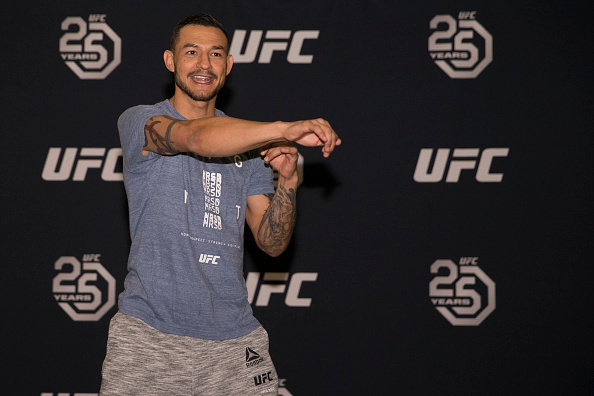 No one knows that better than Cub Swanson, a pro since 2004 who has battled it out with the best of the best in the Octagon and in the gym. His record reads like a Who’s Who of the sport, and he’s also sparred with an equally impressive array of boxers and mixed martial artists. But while he can be a fan of some of his training partners, that disappears when the gloves are on and the mouthpiece is in. He recalls a visit to the Xtreme Couture gym in Las Vegas years ago. It was MMA sparring day, and Swanson didn’t have a willing partner. Swanson laughs, and you know what was coming when the featherweight contender met the heavyweight contender. If you want one story to tell people who Cub Swanson is, that may be the one. This isn’t the typical sport. To be successful, you have to go against any conventional wisdom and tell yourself that the punches don’t hurt, that the wind isn’t escaping your lungs, and that when you’ve already fought your heart out for 10 minutes, you’ve got five more to go and you’re ready for them. To do that once is worthy of a tip of the cap. To do it professionally for nearly 14 years puts someone in an entirely different place when it comes to respect. So when Swanson lost his most recent fight to Brian Ortega in December, marking the end of his UFC contract, the veteran contender thought he might be done with the promotion, but his fans weren’t about to hear that. “Mentally, I was like, ‘All right, that’s it. My chapter in the UFC was done,’” Swanson said, not sure if an offer to return was in the cards. It was, with his new contract kicking off this Saturday with a co-main event against Frankie Edgar in Atlantic City. But between the Ortega bout, which snapped a four-fight winning streak, and his re-signing with the UFC, Swanson found out how respected he really was. If you replace Swanson’s name with Edgar’s and read the above quote, it would surprise no one. The two featherweight veterans are among the most respected figures in the sport, class acts who let their fighting do the talking. And as hard as they compete on fight night, when the bout is over, they will shake hands and move on to the next one. It’s what happened the first time they met in 2014 with Edgar leaving Austin with a fifth-round submission victory. They shook hands and moved on. Swanson didn’t think he would get a second shot at “The Answer,” but after Edgar lost to Ortega as well, he is, and despite the fight being made with five weeks’ notice for both, he jumped at it. A fighter like Swanson never forgets. That can eat at someone, especially in a sport where second chances aren’t guaranteed. But he’s got one now, and he’s determined to get it right.